Ma cherished her memories of her own mother reading to her, in particular Richmal Crompton’s ‘Just William’ stories, and presumably they also would listen together to these stories when they were broadcast on the wireless. Years and years later, that is to say quite recently, whenever Martin Jarvis read these stories on the radio, I would phone Ma to ask if she knew they were to be on. She always did know and she always listened to them. They made her laugh. Not that William’s world was the world Ma belonged to. William’s was a far cry from hers. But the short story is a free country, and you do not need a passport to travel there. (Nor for that matter did Ma’s cat Henry need a passport for his travels, but that is another story…) Ma’s father was a keen reader. One of Kitchener’s citizen volunteers, along with thousands of other young soldiers during the First World War, my grandfather had read, in the trenches, the early military thrillers of ‘Sapper’ and Buchan. Sapper wrote four military novels during that war (his legendary and extraordinarily objectionable ‘Bulldog Drummond’ was not to appear until 1920, though his earlier novels were not short on jingoism and heroics). As well as being commissioned to write an official history of the war for the War Office, Buchan also found time to write three thrillers – The Thirty Nine Steps, Greenmantle and The Power-House. A director of Thomas Nelson and Sons, Buchan early on in the war saw a great opportunity for Nelson to publish popular fiction for the Tommies fighting in France. A shrewd business move both for Buchan and for Nelson, this was also a hugely important morale-booster for the men at the front. Many years later, it amused Ma when she came to hear Buchan’s novels described as ‘snobbery with violence’, a description with which she largely agreed. But she read these novels not because she was a racist, imperialist snob or a member of the ‘flog ‘em, shoot ‘em, hang ‘em’, brigade, but because her father had read them himself as a very young man. And I suppose her interest in detective fiction came from her maternal grandmother who, it was said, used to read Ellery Queen stories from behind her missal, while giving the impression of Catholic womanly piety and great devotion. 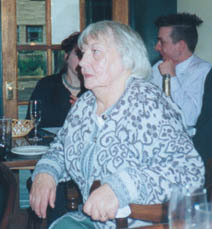 Ma’s tastes in reading were eclectic and had been influenced by her family and her upbringing, later by her own growing interests, by her education, by recommendations made by her sisters and brothers, her god-daughter and nieces, and by my sister and myself, even latterly by the Richard and Judy Show’s ‘Book Club’. And she was always interested in what other people were reading. I do not wish to give the impression that our mother spent her life with her nose in a book, led a charmed existence, and did nothing from first light to last but strive to improve her mind or seek diversion through books. This would be absurdly the wrong impression to give. She had four children to bring up in addition to looking after her father-in-law, in whose house we all lived. I cannot remember a time when we children did not read or were not read to. We always had books and read them, sometimes even embellishing them with original artwork and interesting marginalia; at one point we children set up our own lending-library, with home-made labels pasted onto what I now know to call the front end-papers. I remember in particular Dent’s Children’s Classics – these included a good deal of Stevenson and Dickens (abridged, of course), and Grimm’s Fairy Tales, Tom Brown’s Schooldays, Swiss Family Robinson. With no terrific interest in detective fiction myself, I remember having read by the age of 11 or 12 Agatha Christie by the ton, and I recall, possibly a little before this, how I would take down Ma’s own books – fiction mostly – and look through them. Too difficult for me, much too grown-up, far too many words for me at that time. During our childhood years, Ma probably snatched what time she could to read a little after we were all in bed, most likely a novel. And I remember there were always the Sunday papers. Ma read the Observer, and for us there was the Sunday Post. I think, even then, we children all understood instinctively there was something quite limiting about the Post. From what I gather, Ma had taken the Observer for years, starting, I imagine, when she first went to study at Newbattle Abbey College in the mid-1950s, missing Edwin Muir, who had already gone to Harvard. In the late 70s, in the last days of the last Labour government we were to know, we started to take the Sunday Times as well as the Observer, if only to keep ourselves closely informed about what the opposition was thinking. Then early on in the sad, distracted times of the Thatcher regime, we decided to take the New Statesman. This made very depressing reading, but it was essential to have a left-wing perspective on current affairs, and it was important to support that publication. Moreover, the weekly column by the legendary (and incongruously far from left-wing) Arthur Marshall was for Ma a great antidote to the other articles. Before his services were dispensed with by the New Statesman, for which he had written on and off since 1935, Marshall latterly filed his column from ‘Myrtlebank’, his cottage in Devonshire, his style as irrepressible as the girls he wrote about in his famous parodies of girls’ school stories. It was Frank Muir, his sparring partner on the television programme ‘Call My Bluff’, who described Marshall as ‘a rather portly sunbeam’, ‘the bubbles in the champagne.’ And the NS competitions to compose limericks, clerihews, rhymes, and slogans Ma found great fun too. During the late seventies and through most of the eighties Ma was a NUPE shop steward in a local hospital. A scrupulously conscientious trade unionist, she became more and more involved in politics, campaigning against low wages, the erosion of conditions, the threat of redundancies and creeping privatisation. For a time, the New Statesman was essential reading for Ma. But as the Thatcher years dragged on, Ma stopped taking it, there being only so much reality that humans can bear. Work became increasingly exhausting and the only difference between Ma’s work and enforced hard labour, was that Ma was allowed some pay for her labours; her union activities became more demanding and any advances made seemed to be in inverse proportion to the effort required to achieve them. As Stevie Smith so encouragingly put it, ‘all good things come to an end, the same goes for all bad things too’, and so in 1987 Ma retired. She had thought of going in her retirement to Ruskin College, Oxford, to read for a degree in English literature, but when she reached sixty she decided that she could read all she wanted to at home, at her leisure, and would instead freely spend time doing what she really wanted to, reading and gardening. Books do furnish a room. And here they can also help describe aspects of a life. Ma had many books, and these could be found around the house in the many book-corners. By her armchair in the living room, where she would do some of her reading, is a long book-shelf. Here are her dictionaries and reference works, a crossword dictionary, Chambers’ Biographical Dictionary, the Concise OED and the Collins’ English Dictionary, shorter encyclopaedias. (Ma would from time to time treat herself to a new dictionary or encyclopaedia. Now and again, my sister or I would buy a replacement Pears Cyclopaedia or Whitaker’s Almanac for her. These weren’t massively helpful for the Scotsman crossword, but she found them fascinating in themselves.) It was in the living-room, in her armchair, that she would begin the process of doing the crossword. After beginning it downstairs, she would attempt to complete it later – in bed. She didn’t share the politics of the Scotsman, but liked one or two of its crossword compilers, in particular the maddeningly cryptic challenges posed by Peter Bee. By her bed was a small unit with two shelves on which there were some smaller dictionaries and reference works and a copy of a slightly more heavily-used crossword solver’s dictionary, which was kept upstairs because it was so tattered. In the bookcase in Ma’s bedroom are those works she read and re-read, her favourites. Among some of these titles are works by Ronald Knox, a writer whose name I had grown up with, but had not read. ‘With his friends G.K. Chesterton and Hilaire Belloc, Knox was the third man of the trio of witty and brilliant apologists of the Catholic faith in England’. In order to write this piece, I have now read a few of his books, to find out what Knox was about and what his appeal was to Ma. Ronald Arbuthnot Knox was the son of one bishop and grandson of another and one of the famous Knox Brothers: Edmund, who became the editor of Punch and was celebrated for his comic and light verse; Dillwyn, the classics scholar, who was a cryptographer and breaker of codes and worked in Naval Intelligence during WW1 and again during WW2 at Bletchley Park; Wilfred, Anglican priest and teacher; and Ronald, who first became an Anglican Catholic priest, before he converted to Catholicism in 1917. Ronald was regarded by the Catholic hierarchy both as an impressive catch and as something of an unknown quantity – though his theological writings were undoubtedly just what some of the more enquiring minds of the English Catholic laity required at that time, he was too intellectual by far for the English Catholic bishops who, while unquestionably sound on doctrine and dogma, were traditionally a bit unoriginal, limited, or even defective in the thinking department. Knox also translated the Vulgate Bible into English: his translation of the New Testament was published in 1945, that of the Old in 1948. There were readings from both at our mother’s requiem mass. Because of church politics, Knox’s translation of the New Testament was eventually ‘approved as an official version’ but was never widely adopted in the UK. His translation of the Old Testament received the imprimatur only for ‘private use’. Ma first came to know Knox in adverse circumstances, by way of one of life’s great ironies, as a result of being bullied by a village dominie in Fife when she was evacuated there with her younger brother at the beginning of the Second World War. For some reason this bigoted, but not completely unread village dominie, was not terribly happy that two Catholic evacuees from Edinburgh should have been sent to his non-denominational, i.e. Presbyterian, school in darkest Fife. (Do remember that anti-Catholic sentiment was rife in parts of Scotland during the inter-war period and the threat of Catholicism to Scottish life was regularly debated at the Annual General Assembly of the Church of Scotland in the 1930s, these bigots being described by MacDiarmid as ‘Nuts in May!’) This dominie used to make fun of my mother and her brother about a certain Monsignor Knox who had gone over to the ‘other side’. Knox had defected to Rome some twenty years earlier, and God only knows why this school-teacher should still have been nursing his wrath over this Anglican clergyman who had changed his spiritual allegiance years before. But then, bigots, it seems, are constitutionally incapable of ever forgetting, and bullies require victims. My mother and her brother were made to feel very awkward because of this Monsignor Knox, and felt they were being held in some way responsible for his defection, which was made all the more frustrating for them because they did not initially know who this Monsignor Knox was, or what was meant by the ‘other side’. Ma quickly learnt that she and her brother constituted the ‘other side’ when the petty tyrant of the village school did nothing to stop his god-fearing Protestant charges from making fun of a visiting priest who came to the school to hear my mother’s and my uncle’s confessions and to say mass and to give communion. This was enough to cause my uncle, less resilient than his sister, to run away from Fife and back to Edinburgh, never to return. My mother chose to stay on. Her own mother was already very ill in Edinburgh, and was to die the following year. Perhaps the unpleasantness of school in Fife was easier for Ma to bear than returning to Edinburgh. By way of another irony, my mother, as an evacuee, spent a year or two in the manse of the village where she went to school. (She had also lived briefly in the local castle.) The minister, unlike the dominie, was a good man. He had served in the same regiment during the First War as my mother’s father and when my grandfather came to visit my mother, he and the minister would recall at this safer distance the horrors of the First War and discuss the uncertain progress of the Second. Looking back more than sixty years later, Ma still felt saddened by her memories of the petty tyrant of that village school. While it was one thing for Ronald Knox to be regarded with a certain degree of suspicion by some of his co-religionists, and that was perhaps their prerogative, it was quite another thing for him to be calumnied by a ridiculous little tyrant in Fife. But some good did come out of that bitter experience: this was Ma’s desire to know more about this Monsignor Knox and to find out what it was he had done that should have caused so much apparent upset to so many Protestants. This lead to Ma’s life-long interest in Knox whose literary and occasional essays she came to regard very highly, but whose detective stories she did not rate at all. (Ma’s lack of enthusiasm for the detective stories was also shared by Knox’s religious superiors, but for largely different reasons. The bishops took great exception to them, and not on literary grounds either, and believed they risked bringing the priesthood and the Church into disrepute. Aficionados of the genre must make up their own minds about Knox’s detective stories: I would suggest The Viaduct Murder and The Body in the Silo. The rest are perhaps best avoided). 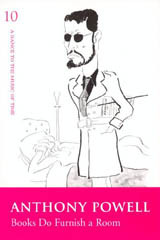 According to Evelyn Waugh, Let Dons Delight was Knox’s own favourite work. I think it was Ma’s favourite too. First published in 1939, Let Dons Delight is a charming set of ‘Variations on a Theme in an Oxford Common-Room’, and was regarded by Waugh as Knox’s ‘most brilliant piece of secular work’. This work consists of the many different kinds of common-room talk which Simon Magus College had witnessed over the many centuries of its existence and which are overheard and recorded by the author in the form of a series of dramatic dialogues, except they are the by-product of too much port the author has enjoyed, after which he has nodded off and dreamt these conversations. There are two distinguishing features about this work. The first is Knox’s great ability to recreate the various conversational styles of the periods over three and a half centuries in which his dream-conversations take place. And the second is Knox’s satirical treatment of his dons who always, always, always get their predictions wrong: in the time of Raleigh one don insists, ‘you will not teach the potato to grow in Ireland’; during the Enlightenment another don states, ‘Beattie will be remembered very much longer after Hume’, adding that, ‘the Germans will never be anything in philosophy’. At one point, a Unionist don staunchly avers, ‘I do not think we will have much trouble with the Irish’; and another, in the years before the French Revolution, expresses his firm opinion that ‘the French will not revolt’, and so on. The last dream-conversation the author imagines he hears ends with one don giving in to the inevitable and saying, ‘after all the next world-war is scheduled to break out in July, isn’t it?’ Except the author is no longer asleep, it is no longer a dream. It is 1938. Not by accident is this chapter entitled ‘Chaos’. Long before Ma knew that Evelyn Waugh had written – or was to write – his ‘brilliantly discreet’ biography of Knox, she was already familiar with Waugh the novelist. In fact, Ma’s older brother – who had been a Marine Commando – had the noteworthy misfortune to know Waugh during the waugh! In 1939, wishing to do something suitably appropriate for his country, Waugh was ‘hopeful of a commission in the Marines’. According to his biographer Martin Stannard, Waugh ‘looked to the Marines to supply the virtues of dignity and discipline’ and in the Marines ‘believed he had found the courtesy and taste of the eighteenth-century gentleman surviving among its regular officers.’ Stannard writes, ‘at thirty-six, Waugh was the oldest recruit, and his enlistment in such a unit suggested that baffling combination of humility and arrogance which never ceased to shock Waugh’s friends and family. The myopic and blundering Waugh could not quite see down the sights of his rifle and had once got lost in a blizzard at training camp, even with binoculars and maps. After a stint with the Marines, Waugh was, to the astonishment of some, transferred to the élite fighting force of the Marine Commandos, though he was soon transferred back to the Marines. Gradually, but firmly, Waugh was removed further and further away from any possible action and transferred to the Royal Horse Guards. Ma’s brother was to become a member of the Special Boat Service which helped begin the liberation of France in 1944. Waugh will, of course, be principally remembered for his novels. Ma read Waugh’s novels and enjoyed them for the satires that they are. Again she had some good first editions of his later novels, but these were much less valuable to her than her battered copy of his life of Knox. Another favourite writer was Anthony Powell, whose A Dance to the Music of Time she read and re-read. Like her copy of Waugh’s life of Knox, her paperback edition of Anthony Powell’s A Dance to the Music of Time has seen better days. Incidentally, Powell had been a neighbour of Knox and according to Waugh, ‘Knox spent happy hours bottling wine with Powell.’ (Knox apparently used to complain that Powell’s novels were ‘too difficult for him’). Before I happened upon a set for sale, Ma had frequently borrowed volumes of Powell’s epic from the local library. When she had her own edition, she read and re-read Powell, re-visiting the books in any order it pleased her, coming to know the characters as old friends, and she never ceased to take delight in learning from revealing articles in the papers or from book programmes on the radio which of Powell’s friends and acquaintances he had based his characters on. The unlikeable Widmerpool was, I understand, based on Lord Longford, whose sister Powell was married to. Just a few weeks ago, Widmerpool was paid a compliment of sorts in a radio play by Joan Bakewell, about the shenanigans of members of a panel of judges of the Widmerpool Prize, a literary award. Ma would have enjoyed listening to that play and would have explained to my sister and to me precisely what was the significance of Widmerpool as Joan Bakewell’s choice of fictional and fictitious benefactor, giving supporting chapter and verse. Having read Powell’s A Dance to the Music of Time only once, I do not have the same degree of intimacy that Ma had to explain why Bakewell chose Widmerpool. She was pleased when Michael Barber’s biography of Powell appeared last year – I bought her a copy for what was to be her last birthday. Because she felt that Powell’s A Dance to the Music of Time was so very richly autobiographical, she found Barber’s biography a little disappointing. Another book-corner is at the top of the stairs, opposite my mother’s bedroom. In a deep recess there is the tall bookcase which contains, among other things, Ma’s books on and about the First World War. Among them are: works by war historians including A.J.P. Taylor, Richard Holmes, Alan Clark; Churchill’s writings on WWI; poets of the First World War; novels by Winifred Holtby, Vera Brittain’s Testament of Youth, Woolf’s Jacob’s Room; novels by Rebecca West and by Pat Barker. Born only nine years after the Armistice, Ma had a lifelong fascination with and a huge knowledge of the Great War. Her father had survived the entire war in Europe as had her mother’s only brother, until in August 1918 he was transferred to Russia as part of the Allied Intervention to put down the Communists. He was killed in action off the north coast, two weeks before the Armistice. His niece, Ma’s sister, was born two weeks before he was killed. The death of this young man cast a huge shadow over the lives of his mother and his sisters. His nieces and nephews, while they could not know the cause of the sadness that pervaded their early life, nonetheless experienced that sadness. I now wonder if it was Woolf’s partial attempts to deal with the Great War in Mrs Dalloway and Jacob’s Room, in particular, that might also have accounted for Ma’s reservations about Woolf as a novelist. I do not know. The bookcase in this deep recess is a tall one and has seven shelves and so is not devoted entirely to books on or about the First World War. On one shelf is Ma’s set of Dickens. This is a standard (i.e. cheap) edition of Dickens, which was augmented over the years by various Penguin editions with introductory essays by such luminaries as J. Hillis Miller, Angus Ross, Angus Calder, et al. After Ma retired from work, I took out for her a birthday subscription to The Dickensian, which I renewed annually. Some of the more arcane pieces of research published in The Dickensian Ma found fatuous, but she looked forward to each copy. While she couldn’t quite admire Woolf, and felt she was limited, she thought that all of life was contained within Dickens. Ma found Woolf’s world-view much too restricted, as she did to a slightly lesser extent the world of Iris Murdoch. 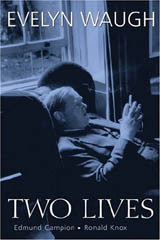 While the mandarin ghettos about which Woolf and Murdoch wrote were not utterly alien to Ma, she often said, as many others have, that these two writers had especial problems making ‘ordinary people’ credible in their novels, and were capable only of giving them walk-on parts and according them no interior lives of their own. By contrast, Ma felt differently about Dickens and his characters. She felt that in Dickens there are indeed no ‘ordinary’ characters, for all his characters are extraordinary and can be credited with an existence of their own outside his novels and even beyond his imagination. Every last one of his fictional creations is made from material from life and from a world that, for Ma, was real, or at least credible. Of course, she appreciated in Dickens all those absurd, spectacular and fantastic elements that are the life-blood of his work. For Ma, this was what made Dickens great. Last winter, not long before she became ill, Ma re-read A Tale of Two Cities and Oliver Twist. Not that they were her favourites. Like C.S. Lewis, her favourite Dickens novel happened to be the one she was re-reading, though she did greatly love Great Expectations and re-read it regularly. She also enjoyed Nicholas Nickelby immensely. She read Little Dorrit only once. She found it Dickens’ bleakest work and could not read it again. ë sisters and found risible the crank theory that brother Branwell had been responsible for the creation of his sisters’ work; she read Vera Brittain, Pearl S. Buck, Catherine Carswell, Winifred Holtby, Rose Macaulay, Rebecca West, Mrs Woolf, Stella Gibbons, Murdoch, Spark, Bernice Rubens, Fay Weldon, Hilary Mantel. But I have not talked about these writers, nor for that matter about the books that Ma read on popular psychology, politics (and political biography), economics, British, Irish and Scottish history, or education. Just last week, my sister recalled how one afternoon in the local public library, perhaps fifteen years ago, Ma had discovered quite by serendipity a book by the clinical psychologist Feuerstein on his approach to teaching low-functioning children and their potential for change, enabling them to make sense of the world around them. The book appealed to Ma and she borrowed it, later lending it to my sister to read. It is only now in 2005 that Feuerstein’s approach is being taken seriously in Scotland and adopted in teacher-training. The last book-corner in Ma’s bedroom is her desk. A roll-top desk. A piece of Edwardian furniture, of which she was fond; but fonder of it than she, was Henry the cat. Henry loved to explore a route round or through, over or across any free surfaces of the desk, sans passport. Not that a passport would have helped him much. 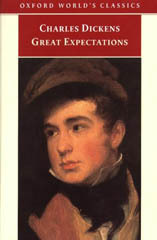 Henry was largely banned from Ma’s room, except after she became ill and welcomed his visits, and because every surface was so covered with books and papers, every time he began to explore, his quota of lives was under threat from Labour Party correspondence and its Red Pepper magazines; copies of The Dickensian; seed catalogues from Thomson and Morgan; copies of The Tablet which I occasionally passed to Ma; catalogues from Hotter Shoes, not that Ma was in competition with Imelda Marcos; and the books that Ma had just read or was just about to read. 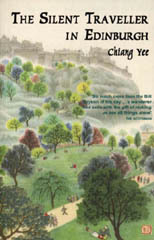 One of the last books Ma read was Chiang Yee’s The Silent Traveller in Edinburgh, which my sister gave to Ma last year. I do not know if Ma read it when it was first published in 1948. She would have been on the Black Isle then, doing work in the Women’s Land Army, with not much opportunity for reading, but I do recall, when we were growing up, that Ma certainly did read all the Jane Duncan novels that had been set on the Black Isle. Although Ma had not lived in Edinburgh for more than sixty years, Edinburgh was her home city and she had a deep emotional attachment with it. Chiang Yee’s book took Ma back to the city of her birth. She found his perspective on her city just delightful, and she rejoiced in ‘that sense of sharing a sensibility involved in experiencing that remarkable city’. So enthused was Ma by this book, she mentioned it to her Chinese hospital consultant a matter of only four of five weeks before she died. I hope he understood Ma’s great enthusiasm for this book and I would like to think he has since read it himself. It could not have come more highly recommended. And there is that other Edinburgh book – RLS’s Edinburgh: Picturesque Notes. I have often wondered if Ma’s own copy might possibly have been made by her own mother in the early years of the twentieth century, when our grandmother had worked as a bookbinder at the Parkside Works. Probably not, it is too fanciful by far, but it is a lovely notion. There are so many other important books I could and should have mentioned, but haven’t. I cannot not say a word about Josephine Tey’s highly original detective novel The Daughter of Time and Potter’s Cyclopaedia of Botanical Drugs and Preparations. 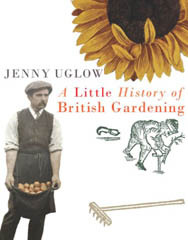 The Tey will always be a very good read, and Potter’s Cyclopaedia will remain indispensable to anyone who loves their garden, grows herbs, makes soups and prepares remedies for aches and pains, as our very remarkable mother did. Quite aware of the fact that she was very ill, when Ma went into hospital for the final time she was still able to read and she packed three special books to take with her: one, her well-read copy of a book about Edinburgh which I had taken to its author just the week before to ask him to sign for her. I said to him how very ill she was, and he was glad to send her his good wishes. The inscription reads, ‘To Helen Lister, Get Well Soon.’ The other two were Jenny Uglow’s A Little History of British Gardening, and a novel by Anthony Powell. A short obituary of Helen Lister appeared in the Guardian on 14 September 2005.